Mine pies remind us of our childhood. Ben’s Grandma would make them in huge batches, filling her home with the satisfying smell of Christmas. Brownies, meanwhile, remind us of winter evenings spent indoors with our feet up in front of the TV, devouring these indulgent treats. And we all know what happens when you combine two of your favourite things. Mincemeat, if you’re not familiar with it, is a mixture of dried fruits, nuts and spices, which is often stuffed inside pastry to make mince pies here in the UK. 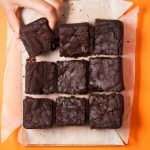 Traditionally it was made using animal fat, but nowadays many brands use vegetable fats, so it’s really easy to find vegan-friendly versions. 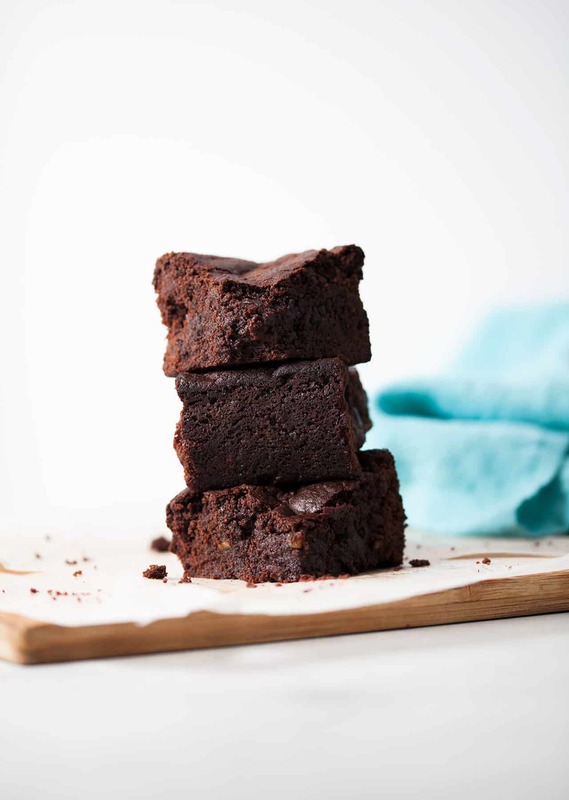 These mine pie brownies are divine. They have the festive flavours we all love, combined with a gooey chocolate mixture. It’s difficult to put into words how much we love these things. And they only take 5-ingredients. So simple. Preheat the oven to 160°C (320°C) fan-assisted and line a 20cm x 20cm baking tin with baking paper. Add the dark chocolate and dairy-free margarine to a metal or glass bowl, then place the bowl over a saucepan containing 2cm (approx. 1 inch) of hot water and bring the water to a gentle simmer on a low heat (make sure the water level isn’t high enough so it’s contact with the bowl). Stir the chocolate and margarine occasionally. Once it has melted completely (this will take 3-5 minutes), remove the bowl from the heat. Add the sugar, self-raising flour and mincemeat to the bowl. Stir until all the ingredients are fully combined. Transfer the brownie mixture to the lined baking tin and use your fingers to level it out. Bake in the oven for 45-55 minutes. Don’t worry if it’s still a little moist in the middle. 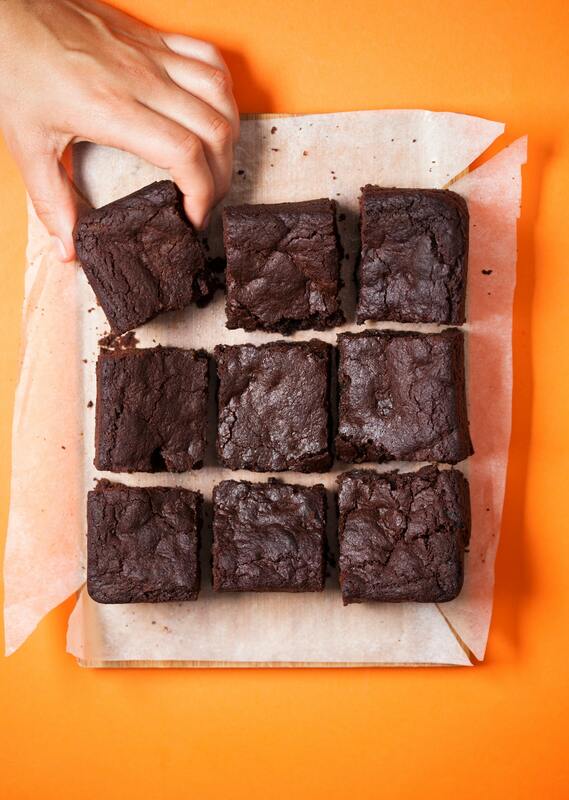 Leave the brownie to cool for 20 minutes so it hardens, then slice it into 9 squares and tuck in! Looks great! But where I live i will not find micemeat (at least not easily and in reasonable price). What can I use instead? My grandma’s home made jam, would do? My ones came out ok at first but then turned rock solid 🙁 any idea what I did wrong? Wow, these are great! A massive hit at my festive dinner party last night and my little boy loves them too. So simple and easy to make. I’ll be making a few batches in the next week. Thank you!